Property Info: 2 Bedroom, 2 Bath beachfront condominium, Sleeps up to 6 people. 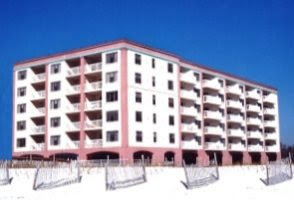 Beach Colony condo rental in Perdido Key Florida with amazing views of the Gulf of Mexico and the sugar-white beaches. This Perdido Key vacation rental home at Beach Colony can accommodate six guests, with a king-size bed in the mst. bedroom and 2 queen-size beds in the guest bedroom. This incredible gulf-front residence is the perfect get-away for entertaining family and friends and enjoying the gulf coast lifestyle. Enjoy the magnificent views of the Gulf and the white-sand beaches from inside the residence and from spacious private balcony. The spacious guest bedrooms have queen-size beds, flat-screen HDTV’s with cable, and a private door into the shared bath with a large walk-in shower. The living area in this resort home includes 2 sofas, a club chair, 50′ flat screen HDTV, and a sliding glass-door opening to the balcony overlooking the Gulf. The living area is very open and spacious. The large kitchen is fully-equipped with microwave, disposal, refrigerator, ice-maker, range, dishwasher, etc….a washer & dryer are also included. Beach Colony resort amenities include a fitness facility, an indoor pool with hot-tub and 2 outdoor pools. A pristine portion of the Gulf Islands National Seashore is located on the eastern part of the island. Perdido Key State Park, a popular destination for visitors, offers unspoiled white-sand beaches in a subtropical climate – the perfect place for a family picnic while enjoying popular outdoor activities on the Gulf Coast – this resort community is a great place for families Experience popular Perdido Key restaurants like the Fisherman’s Corner, Sea-n-Suds, The Crab Shack, Lillian’s Pizza, etc. and enjoy some of the freshest seafood anywhere.